Parents of children diagnosed with autism face a bewildering range of 'treatments' for autism. International reviews, however, consistently point to the importance of using evidence-based practice to educate parents and children. A science of behaviour (Applied Behaviour Analysis) underpins the most effective treatments but there is a severe shortage of training courses across Europe to prepare professionals to meet the needs of parents and children (see BACB). To address this concern, and the resulting myths about Applied Behaviour Analysis that have sprung up, Leonardo, part of the European Commission's Lifelong Learning Programme is supporting an innovative multimedia programme first developed in N. Ireland by local charity Parents' Education as Autism Therapists (PEAT) and Behaviour Analysts from the University of Ulster. Called Simple Steps, this multimedia program uses video material in the form of parental testimonies, animations, demonstrations, and textural material to teach the principles of Applied Behaviour Analysis. The goal is to demonstrate how the practice of science impacts on how one maximises the learning opportunities for children with autism. If we can help parents become proficient in delivering home programs for their children, it will make it easier to coordinate these learning opportunities for the child with those provided within a school. Of course, will parents still need supervised by a professional trained in Applied Behaviour Analysis to international standards. The project funded by Leonardo is called STAMPPP and the goal of the previous funding was to update the original Simple Steps and provide translations in German, Norwegian, and Spanish; 1000 free copies were distributed in each partner country. The original project was recognised as an example of excellence by the European Commission and was included as a case study highlighting best practice in Inclusion. 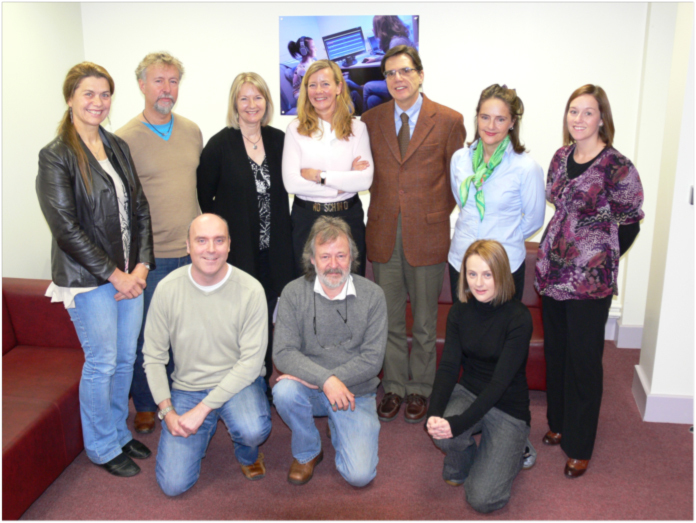 Back row, left to right: Prof. K. Dillenburger, Dr. Neil Martin, Sigridur Jonsdottir, Dr. Jacqueline Schenk, Prof. Paolo Moderato, Dr. Lise Roll-Pettersson, Lynsay Mulcahy (PEAT). Front row, left to right: Dr. Stephen Gallagher, Dr. Mickey Keenan, Nichola Booth (PEAT).